Prominent & Leading Manufacturer from Dadra, we offer horizontal bench type equipment, dual magnetization yoke, battery powered yoke, mains operated ac yoke, mobile power type equipment and eeciflux power type equipment for magnetic particle. Part Weight Capacity 80-90 Kgs. 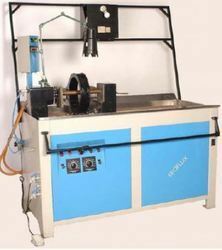 Horizontal Bench Type Equipment is a multidirectional magnetization unit with capability to magnetize up to 2000 Amps. It provides alternating current (AC) and full wave DC (HWDC) as test current for effective magnetization and surface and subsurface detection of cracks. It can be used in industries like Forging Shops, Aircraft Overhaul Stations, Heat treatment Plants where high magnetizing currents are required with high level of accuracy. Block Pump and Hand Nozzle. Pneumatically operated headstock with foot switch (100 mm stroke length) & rail mounted hand-operated tailstock, both with steady rest for heavy job handling. Delivers AC and HWDC for surface or sub surface flaw detection. Articulating and double jointed legs contour easily to any shape to assure good contact. Built standard for continuous inspection. 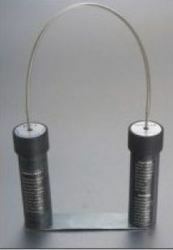 DC Magnetisation operated on a rechargeable battery. Portable for magnetic particle inspection. Can be used for in-plant structures as well as fieldwork. Battery pack housed in a case with shoulder strap, battery charger & yoke carrying bag are provided. Complies with various international specifications. The battery is suitable for high ambient temperature. Articulating and double-jointed legs contour easily to any shape to assure good contact. Lifting Capacity At 100 mm Pole Spacing 6 Kg. 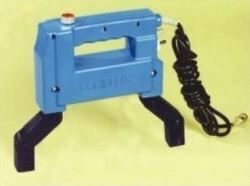 Input Supply "230 VAC 50 Hz (EF-4Y) 110 VAC 50 Hz (EF-5Y)"
Articulated legs with 25 X 25 mm pole area. Exceeds specific lift weight requirements. Suitable to use in all type of industries. Open Circuit Voltage 16 V Max. To fulfill many test problems in some industries like foundries, welding shops & Aircraft Overhaul Stations, magnetic particle inspection demands portability with a high level of magnetizing current, we manufacture Mobile Power Type Equipment & Accessories. The unit is suitable for working on AC & HWDC as test currents. Rugged construction for reliable magnetic inspection. Heavy-duty caster wheels make it possible to carry unit anywhere on the shop floor. Detects surface as well as subsurface defects. 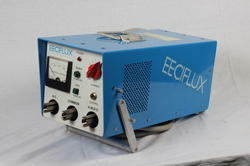 Capable of detecting defects in all directions using prods, Central conductor or 5 turn coil. Inspection can be done with dry as well as wet method. Thyristorised self-regulating current control with closed-loop feedback for compensation of voltage fluctuations, electrical resistance & Prod placements. Remote control option for convenience & productivity. 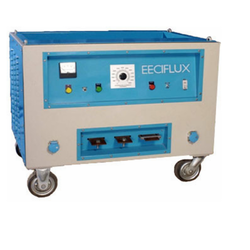 Equipped with two output ports of 230 V, for attachment of backlight and AC/HWDC Yoke. Provided with heavy-duty bolt type connectors. Switch over from AC to HWDC is manual. Heavy-duty Cycle 2 min. ON & 2 min. OFF. Thyristorised stepless solid-state current control. Quick disconnect type of prod connections. Can detect surface as well as sub-surface defects. Equipment is built standard for continuous inspection. Lifting Capacity 18 Kg at 100 mm pole spacing. 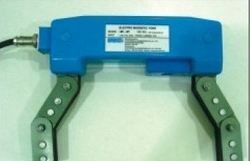 We provide Permanent Magnetic Yoke to our customers. For magnetic particle inspection applications as per various international specifications such as ASTM E 709. ASTM E 1444, ASME Sec V, ASME Sec 7. MIL-STD-1949. Requires no mains electric supply. Easy to use, Simple and highly economical as it requires no power. 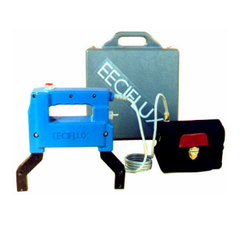 Capable of Testing with both Dry and Wet method of Powder applications. Ideal Inspection tool for Petrochemical industries. Chemical industries. When yoke is energized, a powerful magnetic field is induced around the articulated legs. Defects or surface cracks on the job will create the flux leakage. The defects will attract inspection powder particles, along its profile thus reveling them for inspection. Dry Method: This does not require a black light. This is sensitive to subsurface defects on the rough surfaced components like forgings, castings, etc. Wet Non-fluorescent Method: This is liquid based method suitable for inspection of very fine surface or subsurface defects. Wet Fluorescent Method: In this method part job is inspected under black light Very sensitive to fine surface cracks. Good visibility of cracks is obtained. Easy to use, Simple & Highly Economical. Lifting Capacity: Above 18 Kg, At 100 mm pole spacing. Suitable for both Dry & Wet applications. Ideal in Petrochemical, Off Shore, Chemical Industries, etc. Small, Reliable & Strong Magnet with no requirement of Remagnetisation. Durable and for long life use.